With the rise of violence throughout the world, the incidence of gunshot injuries continues to increase. Gunshot wounds are commonly fatal, and among them, spinal injuries are significantly hazardous. Usually, firearm injuries produce a characteristic pattern with peculiar features; rarely, we encounter some very unusual and unique presentations, which require a lot of skill and competence to handle and may create surgical or medicolegal diagnostic problems. Generally, patients with this condition either present with delayed radicular symptoms or remain asymptomatic., We demonstrate a case of a 25-year old patient, who presented medullary compression due to an epidural bullet, with complete clinical resolution after surgical treatment. A 25-year old patient was brought into the emergency room after he suffered a gunshot wound with a ricocheted bullet. The wound of entrance was located approximately adjacent to the D10 vertebra, and there was no visible exit wound because of the low velocity of the bullet. The patient presented with no signs of hemodynamic instability; he had numbness of both feet and bilateral distal lower extremity weakness. The computed tomography of the abdomen demonstrated no injury to the visceral organs and there was the presence of a bullet adjacent to the thoracic dural sac [Figure 1] and [Figure 2]. It was possible to visualize the bullet inside the spinal canal, above D10. The bullet has caused compression of the dural sac because of the narrowness of epidural space at this level. Surgical removal of the bullet in the acute phase was performed because of the risk of delayed complications associated with the presence of a metallic foreign body inside the spinal canal. Two days after surgery for bullet extraction, a spinal MRI with different sequences without and after gadolinium injection did not highlight any post-traumatic spinal cord injury [Figure 3]. Firearm-related injuries are a major problem worldwide and one of the central issues in modern medicine. Invariably, they are fatal and a little tricky to manage. Among them, spinal injuries are considered to be the most devastating. The damage can be either due to the direct impact of the bullet; due to its projectile fragments injuring the spinal cord; or, due to an indirect injury related to tissue damage caused in proportion to the kinetic energy and the velocity of the bullet. Gunshot wound to the spine was once common only in the military population but is now increasingly prevalent in civilians due to the easy availability of firearms of low velocity. A gun-shot wound contributes to 13–17% of all spinal injuries. A minority of patients have a bone or bullet fragment in the spinal canal. Most commonly, an acute traumatic spinal cord injury occurs on both impaction as well as due to persistent compression, in particular in cases where a burst fracture, dislocation, posttraumatic compressive disc herniation, and in rare cases, a compressive hematoma have occurred. In our case, the bullet was located within the epidural space, and there was no signal abnormality of the spinal cord visible on the post-operative MRI. There was no compressive hematoma. The only mechanism which can explain the delayed radicular symptoms and their reversibility was the medullary compression with the bullet. The patient had an early decompression within 6 h of sustaining the gunshot wound. The patient has been treated by Dr. Mrissa at the Military Hospital of Tunis, Tunisia. Bono CM, Heary RF. Gunshot wounds to the spine. Spine J 2004;4:230-40. Caram PC, Scarcella G, Carton CA. Intradural lipomas of the spinal cord. With particular emphasis on the “intramedullary” lipomas. J Neurosurg 1957;14:28-42. Wu WQ. Delayed effects from retained foreign bodies in the spine and spinal cord. Surg Neurol 1986;25:214-8. Chittiboina P, Banerjee AD, Zhang S, Caldito G, Nanda A, Willis BK. 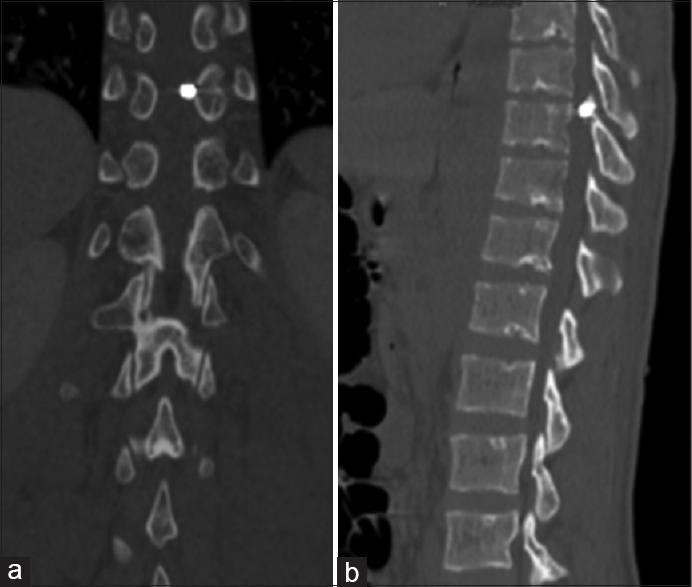 How bullet trajectory affects outcomes of civilian gunshot injury to the spine. J Clin Neurosci 2011;18:1630-3. Bauchet L, Lonjon N, Perrin FE, Gilbert C, Privat A, Fattal C. Strategies for spinal cord repair after injury: A review of the literature and information. Ann Phys Rehabil Med 2009;52:330-51.